Mountain Study is collaborative video and sound installation between video artist Todd McMillan and composer Peter McNamara. 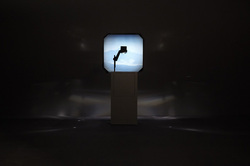 The looped video features images of the Tasmanian Landscape (predominantly from Mt Wellington) displayed by an old-fashioned overhead projector. The looped accompanying soundtrack is heard through a set of stereo speakers placed in the darkened room and features a variety of processed electronic sounds. Mountain Study has been exhibited in a number of venues including the Campbelltown Arts Centre (Sydney), for which it was originally commissioned, the Mosman Art Gallery (Sydney), and the Museum of Old and New Art (MONA) in Hobart. Any parties interested to install this work should contact one of the artists. Image of Mountain Study. Campbelltown Arts Centre 2012.